On 15-th of September 2006, with the start of the study year in the School for blind children in Asparuhovo, Varna (Bulgaria), the new-build lift in the school get into function with a big opening ceremony. Most of the children in the School have not only ophthalmigacal but also locomotory system problems and could not access the cabinets on higher floors. Building a lift in the School was a job of first priority. 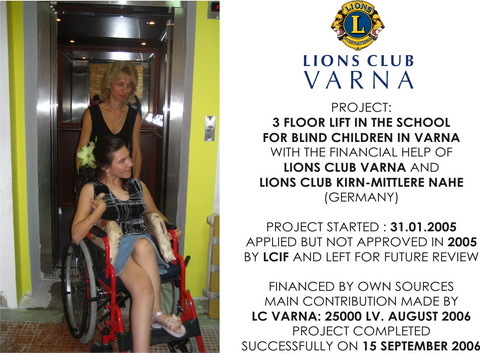 With the help of our Lions friends from Germany LC Kirn-Mittlere Nahe we managed to gather the finance needed and to build the lift. We would also like to thank the Multilift Company which has the lift installed and donated the first lift computer speaking system in Bulgaria. Applied but not approved in 2005 by LCIF and left for future review.